Check out three meaningful actions you can take this week. Every Tuesday, The Nation sends “Take Action Now,” a weekly newsletter that features three actions each week of varying time commitments. This week, we’re continuing to share actions you can take to defeat the Republicans’ draconian health-care bill, along with an opportunity to get involved in the fight to save net neutrality. You can sign up for “Take Action Now” here. Donate to ADAPT. 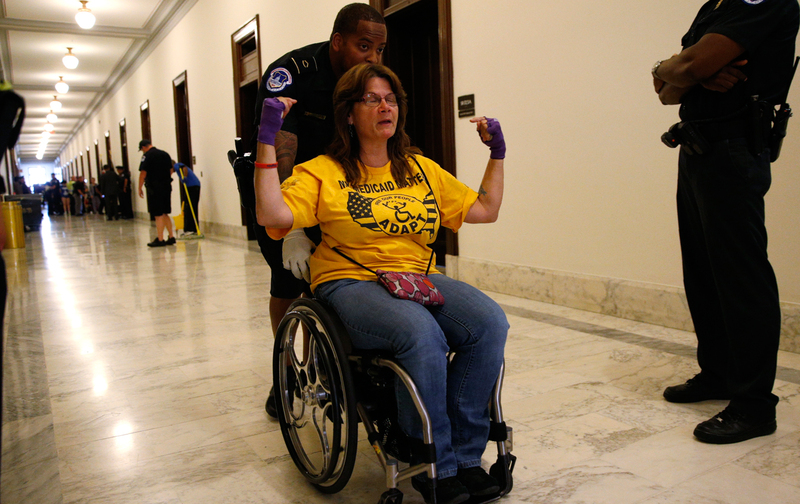 If you’ve seen the pictures of protesters in wheelchairs being forcibly removed from the offices of Senator Mitch McConnell and some of his Republican colleagues, you’re familiar with the work of ADAPT. A grassroots disability-rights organization, ADAPT has been organizing nonviolent direct actions to protest the repeal of the Affordable Care Act and cuts to Medicaid, which many of the organization’s members rely on for their lives and liberty. Your donations to ADAPT will help cover the costs of their actions, including arrest fines for low-income members. You can donate here and find out more about ADAPT here. Join a sit-in this Thursday to save our health care. Of course, the health care fight is not over. This Thursday, July 6, #AllofUs, Democracy Spring, Democratic Socialists of America and others are following the lead of groups like ADAPT and organizing sit-ins at senators’ offices. To participate, you can sign up here. You’ll then be invited to a Slack channel where you can connect with local organizers and watch webinars to help you prepare. Help organize the “Internet-wide Day of Action to Save Net Neutrality.” Trump’s FCC is coming after net neutrality, the concept that all Internet traffic be treated equally. On Wednesday, July 12, activists and companies including the ACLU, Amazon, Reddit, Fight for the Future, and The Nation will participate in an online protest designed to get millions of people to contact both the FCC and Congress, and organizers are looking for people who care about the Internet to help brainstorm and implement ideas. People with access to large online audiences are particularly needed, but anyone can join in. The organizers of the online protest have created video bumpers, widgets to message decision-makers, social media materials, and much more. You can read more about how you can help and sign up to get involved here.